Note your entry fee is used to assist with costs of timing and providing medical assistance during the event. Every entrant gets a participant pack at the end of the race containing merchandise and T'Shirt. Competitors must checkin on the day at least 30 minutes before their scheduled start time. Only competitors who have paid in full (if there is an entry fee for their category) will be allowed to compete in the event. 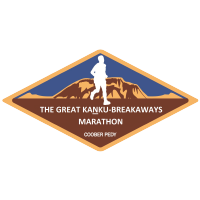 The Great Kanku-Breakaways Marathon is a running, riding or walking event held in the spectacular Kanku-Breakaways Conservation Park in outback South Australia. The event has a number of different distances and diciplines competitors can enter with a 42.2km marathon, 21.1km half marathon run, ride or walk and a 10km and 5km run, ride or walk. There will also be a 2.4km childrens fun run. The Kanku-Breakaways Conservation Park is an Aboriginal owned park in outback South Australia. The entire park is a registered Aboriginal Heritage Site and protected under both the Aboriginal Heritage Act and the National Parks and Wildlife Act 1972. The Park is managed by a majority Traditional Owner Co-management Board which also has District Council of Coober Pedy and Department of Environment, Water and Natural Resources members. The event will run from the main lookout in the park, Kanku Pulka (meaning Big Shelter) down from the escarpment, through the spectacular colored hills of the breakaway country, onto the moon plain and alongside the dingo fence. Competitors then return back to the lookout along the same route but this time seeing the escarpment from the moon plain and then from the coloured hills. Each perspective is different and seeing them both in one visit to the park is a fantastic experience. All the tracks used for the event are closed to vehicles and there are aid stations every 2.5km. Family and friends will be able to watch the event from the lookout whilst enjoying food and drink and services provided at the start and finish line. At the end of the event presentations will be held with the beautiful Kanku - Breakaways as the backdrop. Come to Coober Pedy to enjoy the outback experience and compete in a fantastic community event in a very spiritual place, the Kanku - Breakaways Conservation Park. Chevahn H There will be a meet and greet at Outback Bar and Grill, Coober Pedy in the beer garden from 5pm to 6pm for competitors, organisers and volunteers. Come along to ask any questions or clarify any details. Hopefully we will see you there. Don't forget there is a courtesy bus running on the day from District Council of Coober Pedy to the registration/start line for competitors, volunteers and spectators starting at 8:30am and running every half an hour. There will be limited parking near the lookout so we encourage you to use the bus if you can. Please get to the registration desk, in the park, an hour before your scheduled race start time.